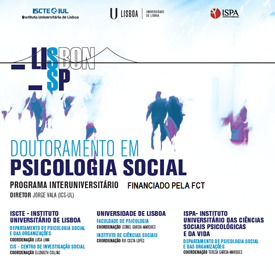 The Lisbon PhD in Social Psychology (LiSP) is an FCT-funded Doctoral program that brings together the three existing Doctoral programs in Social psychology in Lisbon (ISPA, ISCTE-IUL and University of Lisbon). LiSP will function as a federation of three existing doctoral programs. Thus, even though a student who is part of LiSP may benefit from the infrastructures and scientific events of all institutions, he/she must be officially part of one of the three existing PhD programs (ULisboa, ISPA or ISCTE). That choice determines the institution that awards the degree and to whom the fees are paid. LiSP wishes to attract individuals who are willing to conduct research in the field of social psychology. Successful applicants will be those who show the highest potential as graduate students and who will most likely contribute to the development of knowledge in social psychology, either academically or professionally. Most of the potential candidates will be found among those who have a national or international, Master degree in Psychology. However, applicants with a background in related fields such as economy, sociology etc., aiming to complete their scientific skills with knowledge derived from the social psychological theories and methods will also be considered. 3) Social Psychology addresses the most pressing issues of modern changing societies: conflicts in diverse societies and within the new international dynamics, how people accept and conform to the existence of social inequalities, socially critical decision making in asymmetrical contexts. Third: Check the dates for the appliance to the program and go to the University of your advisor in order to enroll in the program. Four: Wait. You will be contacted about your appliance in October.